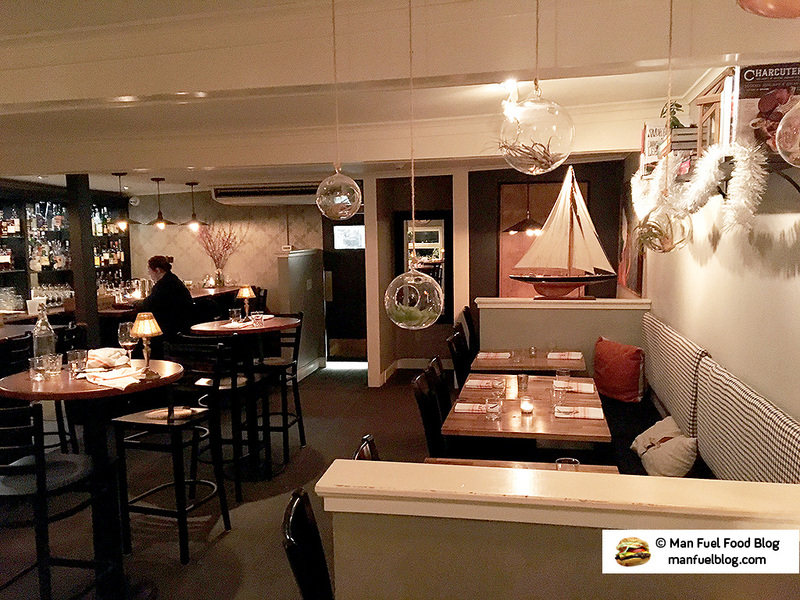 When Persimmon (a really excellent restaurant) left Bristol to move to Providence, I wondered if anything could really fill the empty shoes it left behind. 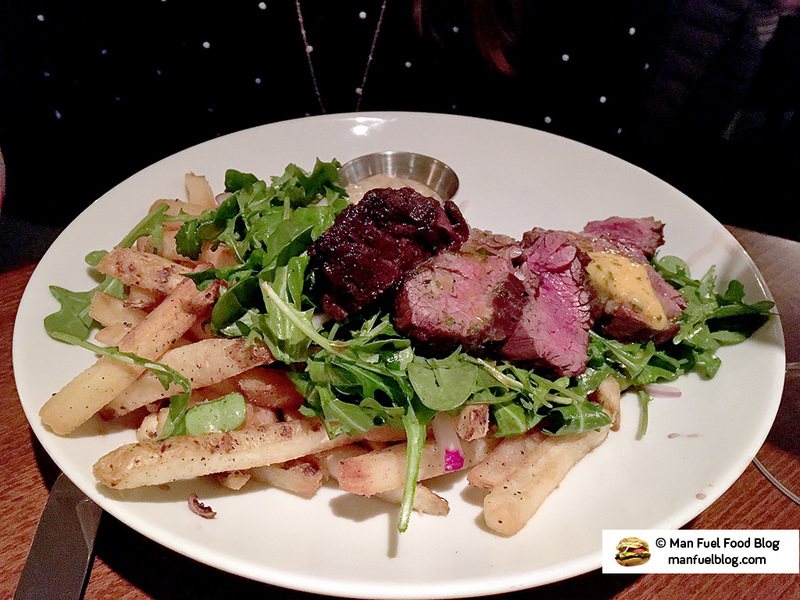 Luckily, Statesman Tavern moved in and while they offer a different experience than the fine dining of Persimmon with its casual comfort food style, the quality makes it a welcome addition to step in to the area. 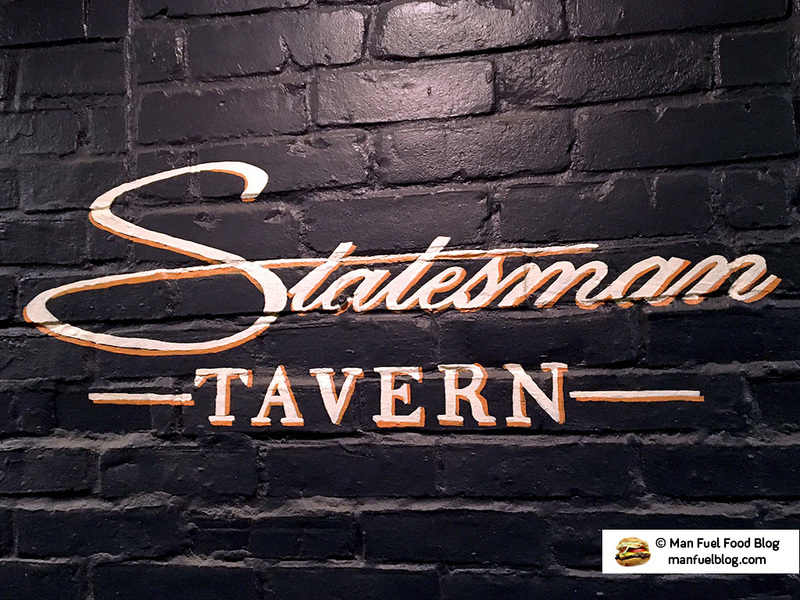 Located in the old Persimmon location, Statesman Tavern has kept the quaint feel of the location while making it more comfortable with some fun, modern touches. While small, the restaurant feels intimate and comforting. The service is friendly and willing to help you decide if you’re having trouble picking something from the enticing menu options. The style of food at Statesman Tavern is a stylish gourmet spin on typical comfort foods. Homemade charcuterie show off the restaurant’s skill while reinvented dishes like the chicken and dumplings show off the restaurant’s creativity. 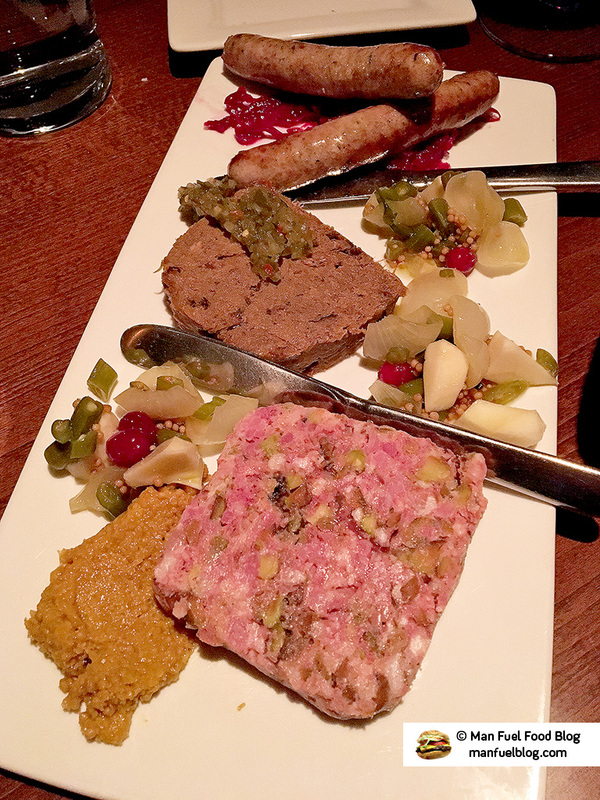 Charcuterie Board – The charcuterie is probably the reason to visit Statesman Tavern. They make some excellent terrines/rilletes/pates (my wife doesn’t even like those preparation styles and even she enjoyed these). The spices mixed in to them offer interesting flavors, but they never overpower the taste of the meat. The smoked pork rillete really blew me away with its mild smoke and sweet pork flavors. The homemade sausages are also very nice with some Middle Eastern spice elements like cumin. 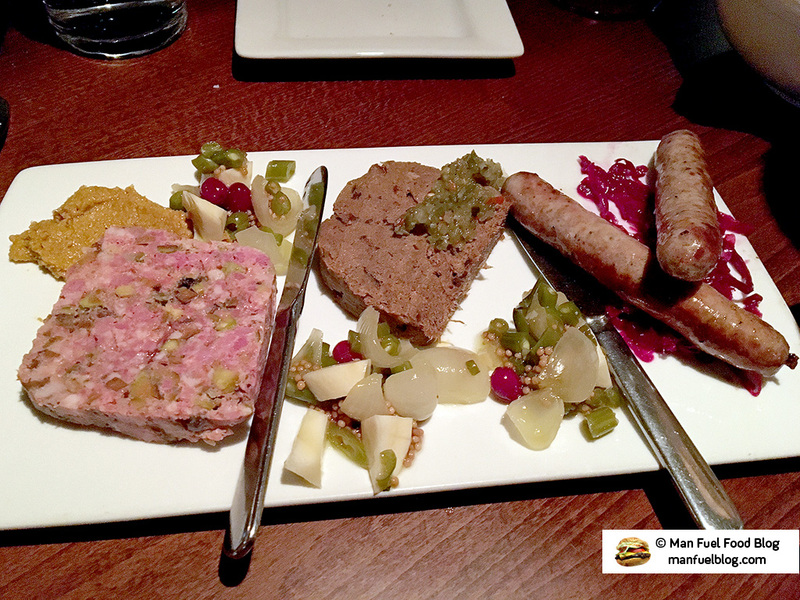 All in all, with the pickled vegetables and mustards, I’d recommend Statesman Tavern for the charcuterie alone. I’d eagerly come back just for a quick beer and some delicious charcuterie. 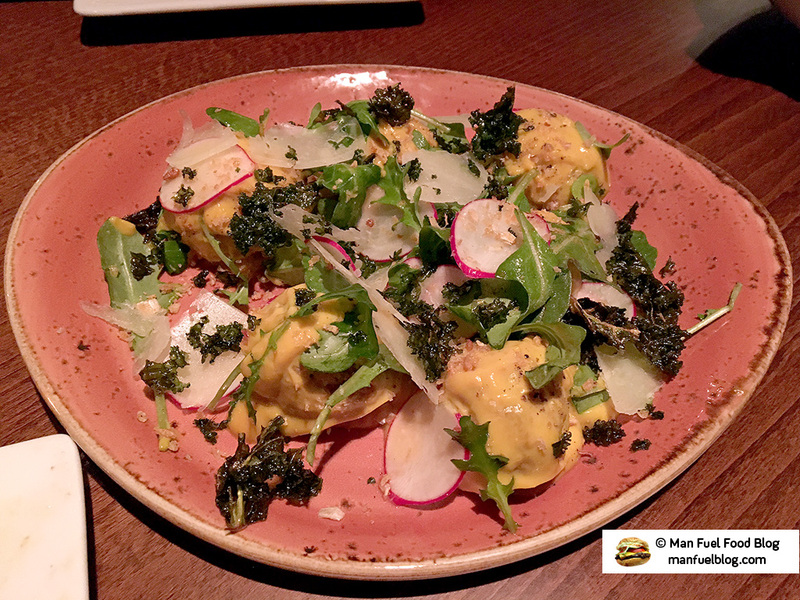 Saffron Chicken Meatballs Special – While beautifully presented and very creative, I’m going to say that this wasn’t my favorite dish. I’m going to go ahead and blame this one on my wife as I personally don’t believe in chicken meatballs! Nonetheless, I thought everything about this dish would have worked very well had the saffron sauce that doused the whole plate been lighter. Saffron is expensive and considered a very posh spice (see what I did there? ), but it also has a very strong flavor. That flavor, when used too heavily, tastes kind of like plastic (at least to me). So in the end, I just tasted a ton of saffron and while it provided a beautiful yellow color, it was just too much for me. 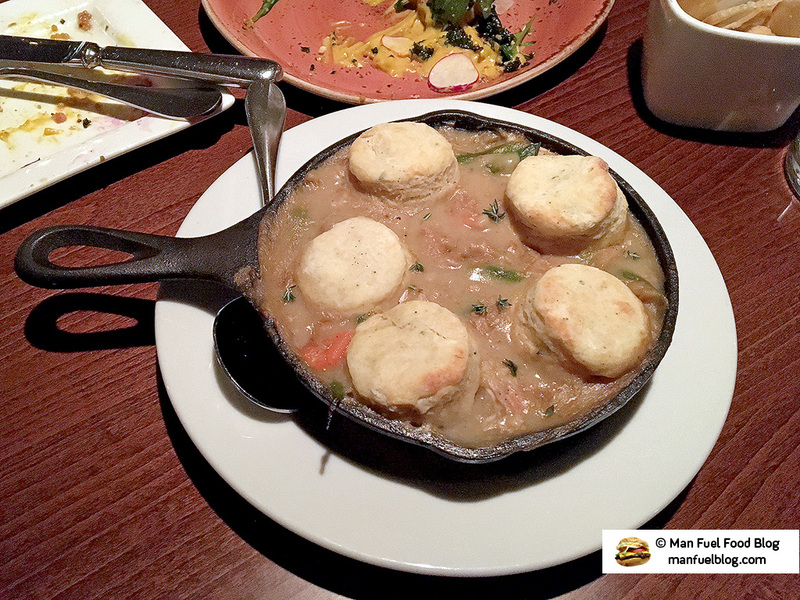 Chicken and “Dumplings” – Statesman Tavern’s take on chicken and dumplings was really interesting and I’m glad I got to try it. They used tiny, flaky, yet super dense, biscuits instead of chewy dumplings. It was creatively served in a cast iron skillet with a thick sauce that tasted more like a thyme infused thickened chicken stock with a mild mustard flavor rather than a creamy sauce. The flavors were very good, but different from what I’d expect from the gravy or creamy sauce used in traditional chicken and dumplings. Different works when the result is tasty. Steak Frites – My wife’s steak frites came out very nicely cooked, but also sliced, which always puts me on guard for dry meat. Luckily, the steak wasn’t dry at all. Unfortunately, the serving size wasn’t very generous, but the overall dish itself was very tasty with the greens. The fries were fairly average and could have been fried a little better to increase their crispiness. A good dish, but average compared to the other really excellent ones we tried. 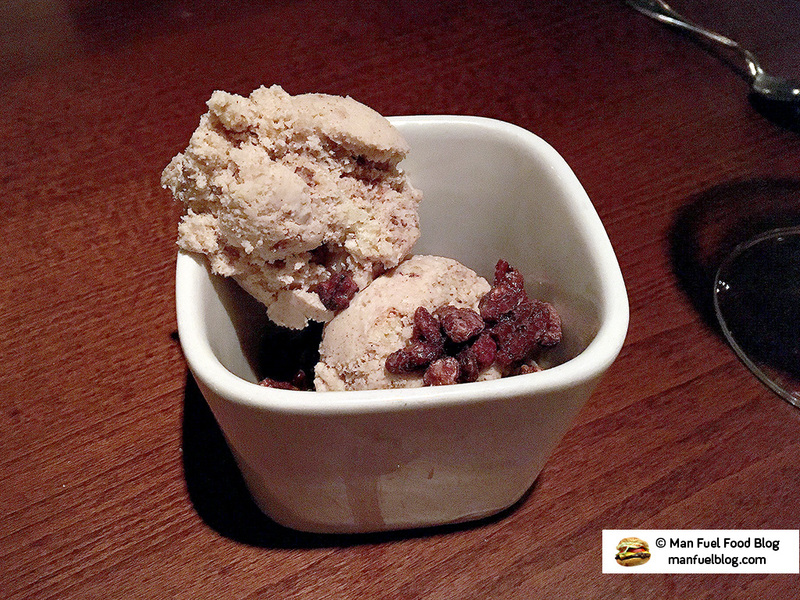 Homemade Cinnamon Bun Ice Cream – The homemade ice cream was an incredible way to finish our meal. We almost didn’t get dessert because we were full, but felt tempted. Our server assured us that we wouldn’t regret trying the cinnamon bun ice cream and we did not. Creamy, cold ice cream danced around cinnamon swirls and candied nuts that made us close our eyes in delight against our bulging stomachs. Well worth saving a little room for dessert! Charcuterie or cheese board lovers must visit Statesman Tavern for a beer and some of their creatively unique starter options. Stay for the tasty comfort food entrees, but I can’t say it enough, don’t pass up the joys of a beer and homemade charcuterie! Those familiar with the Statesman Tavern are sure to return over and over again. Thanks so much for coming in! What a cool review, and very well written. We take great pride in our charcuterie program and are always happy to have fellow charcuterie fans come in. We hope to see again soon! My pleasure! Thanks for the great meal!